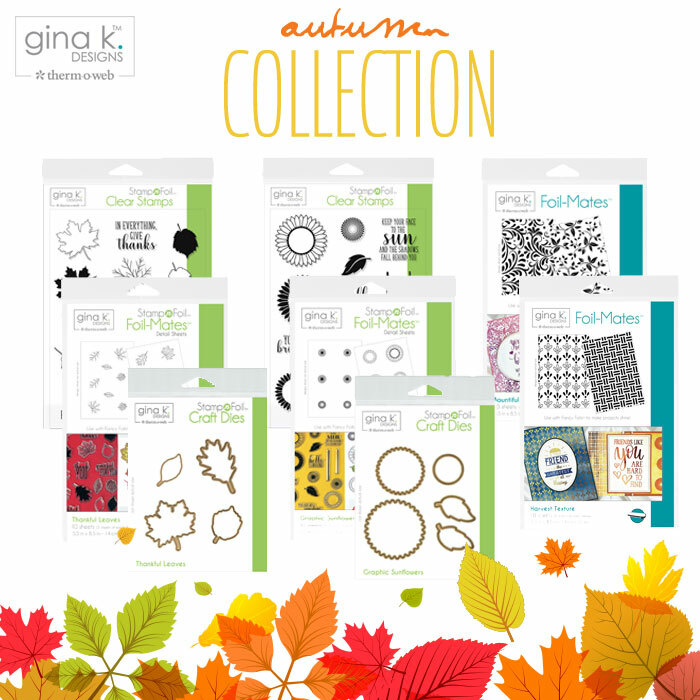 My Cluttered Corner: Brand NEW Therm O Web / Gina K Fall 2018 Release + Giveaway! 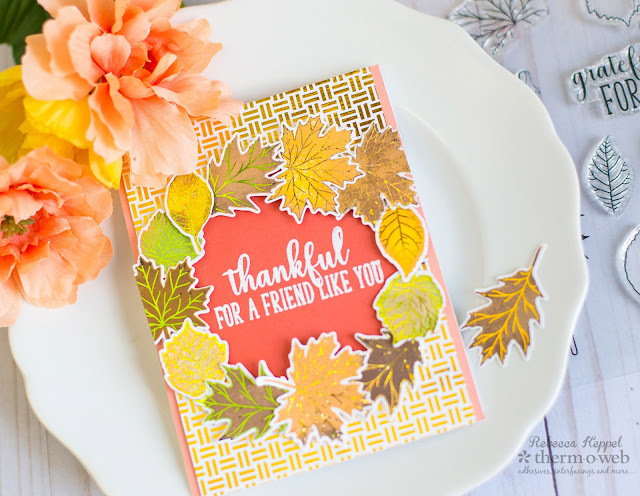 Welcome to the Therm O Web and Gina K. Fall 2018 Stamp N Foil release blog hop! Two random commentors along the hop will win prize packs with new product and more valued at $100!! Don't forget to head over to the Therm O Web blog and enter the giveaway for the entire NEW collection there too! For my cards, I started with the Thankful leaves set. I used the Harvest Texture Foilmate as a background and then stamped, die cut and foiled a bunch of leaves to adhere around a die cut circle to create a wreath. I also love the Bountiful Flourish Foilmates as a background! 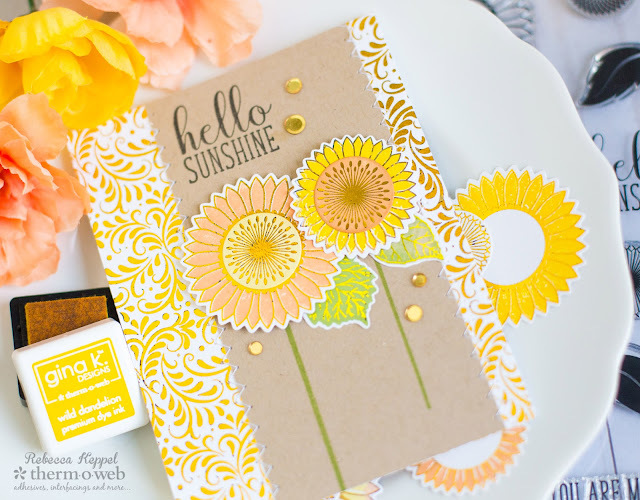 And the Graphic Sunflowers set is perfect, not just for fall, but year round to send someone a sunshine-y hello! Leave a comment below telling me your favorite item from the new release! 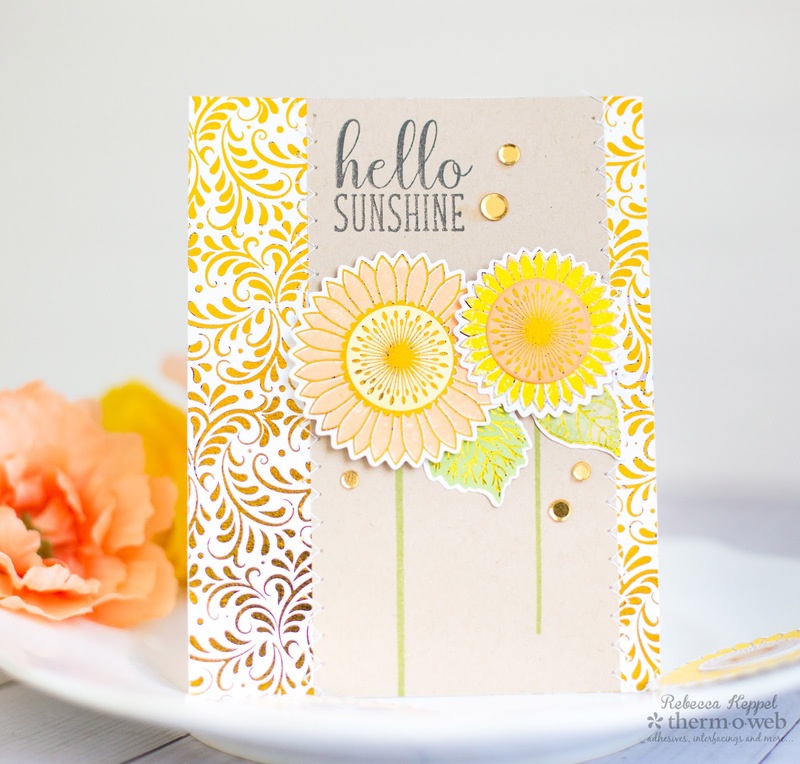 Next up on the hop is the fabulous Shemaine Smith with some GORGEOUS cards to share with you, so be sure to stop by and say hi! Rebecca Keppel ---- You are here! Want even MORE chances to win? Then head over to Therm O Web's YouTube Channel, Facebook Page, and Instagram and be sure to follow or subscribe and comment away. 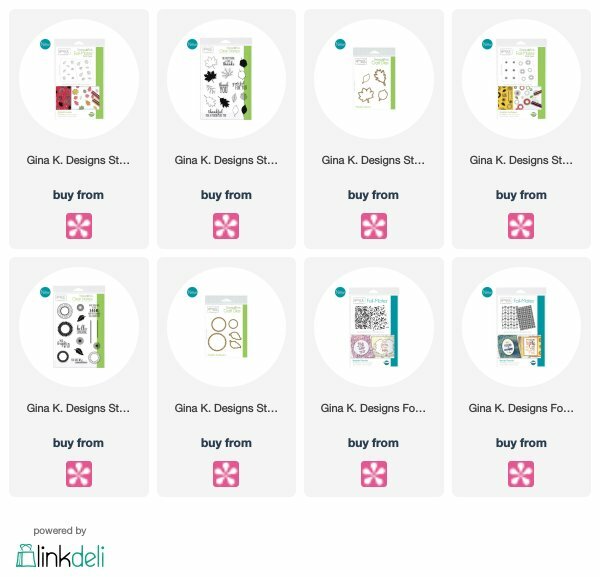 Plus, Gina K. herself is offering a fabulous prize so head over to her blog too! I love the backgrounds! Great cards! Gorgeous creations, great GKD products! I especially love they sweet daisys! What fabulous cards. Love the design you used with the leaves. Love those sunflowers! They are so cheerful and bright! My favorite is the hello sunshine! I really like your cards.......they are perfect, and great combos together! I love the beautiful colors on these cards, perfect for Autumn. Cards are great. Love your idea of making the leaves look like a wreath. Love the Fall colors in both cards. Beautiful works of art. These are both wonderful cards. That autumn wreath is great with the cut out center. Both are beautiful cards Rebecca! Lovely cards! Thanks for the inspiration!! I especially LOVE how you did the leaf card! WOW... they are so beautiful... I love love love them! AWWW such sweet cards! I especially am loving the wreath one! So very lovely! The fall leaves is my favorite. Gorgeous work! Beautiful cards! Love your backgrounds. So many ways to use this set! Love it! It's amazing how the foil just ups the gorgeous on any project! Your cards are beautiful! My favorite item is the graphic sunflower stamp set and dies!! I love, love, love the backgrounds! Beautiful cards! I really like your cards. Most of the cards have been bright. I love the colors you used. Such stunning and sweet cards. Love the warmth from the foil and your color combinations. Fantastic! Both of ur cards are beautiful but im so loving that sunflower🌻 card. Fave item are the....u guessed, the sunflowers! 🌞🌻 love them. Great release ! I really like how you made the sunflowers a focal point on the card. And I love the background on that card as well! Wow!!! Awesome Fall cards!!! Simply stunning!!! Love the wreath of leaves. What beautiful cards! Thanks for sharing. My favorite product is the sunflowers. Your cards are so pretty in those subtle colors! I like how you framed the background with leaves. The foil looks wonderful!!!! You made a very lovely set of cards ! Lovely cards! I specially like the wreath you made with the leaves. I love your use of the backgrounds. Fabulous cards. I like the wreath of leaves. Beautiful cards! Love the foils and stamps! I thought I was a lover of the Fall leaves set; THEN I saw your Sunflowers & how could one NOT feel the warmth of the sun when opening an envelope w/ THIS card inside? I ABSOLUTELY love your use of color on the Sunflowers!! Some say "Yellow is yellow" but they haven't seen YOUR choice of yellow!! I'm melting here just seeing your Beaut! Beautiful cards! the sunflowers are so cheerful! Love the beautiful Fall colours and designs of these cards. I love your cards and your color choices are just so happy! TFS! Love your 2 gorgeous cards!! The beautiful foiling really pops and these images are so sweet! LOVE the sentiments espeically!! Fantastic cards. Love the first one with the leaves and the wonderful sentiment.